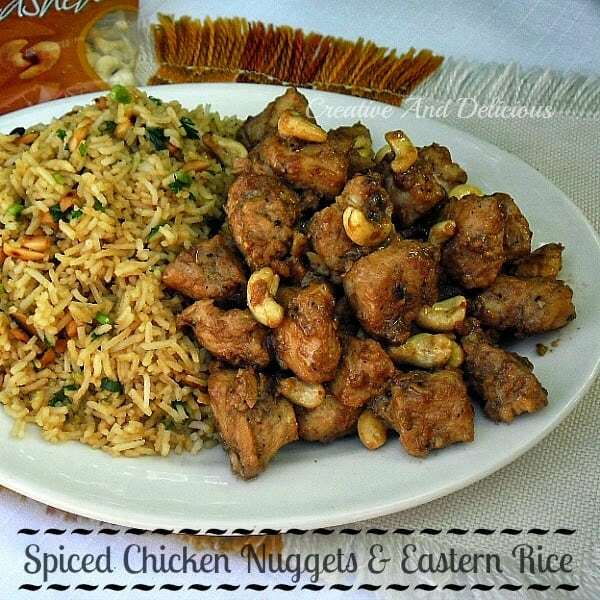 Very tasty Spiced Chicken Nuggets and Eastern Rice is the ideal meal to serve for dinner (recipes for both !) – quick, easy and packed with flavor ! I like spicy, eastern dishes. And these spiced chicken nuggets served with Eastern rice ! Absolutely a perfect combination and compliment each other in the most delicious way. Sometimes I would serve the nuggets, with a coleslaw or a crunchy green salad in a wrap or even in a bun. Actually, if there are any leftovers, someone will most definitely have it for lunch the following day. With or without a bun/roll. And the rice .. well, I have served it with just about any other meat dish as well. 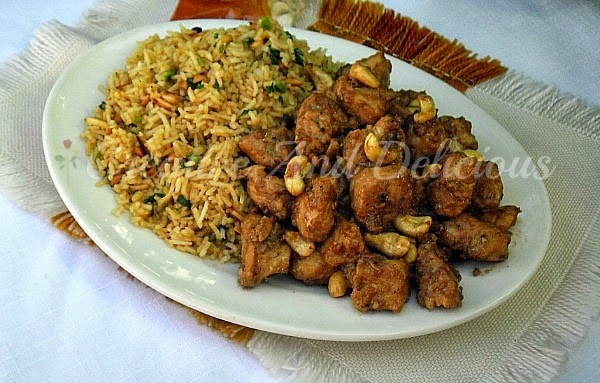 A delicious difference to the usual plain white rice and it needs no gravy or any kind of sauce – fine by itself. 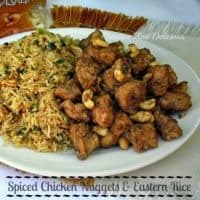 Very tasty Spiced Chicken Nuggets and Eastern Rice is the ideal meal to serve for dinner (recipes for both !) - quick, easy and packed with flavor ! That looks as good as anything I've ever picked up from our oriental restaurants Linda! Yumm! Looks great! I'm pinning to make sure I give this a try! Oh yummy, yummy, yummy! This looks awesome, I enjoy trying new combos. Can't wait to give this a shot! Fabulous dish, Linda. Cheers from Carole of Carole's Chatter. Mmm mm yum grown up nuggets. I love me doe Asian food! Looks delicious! Thank you for linking up at Tasty Tuesdays! 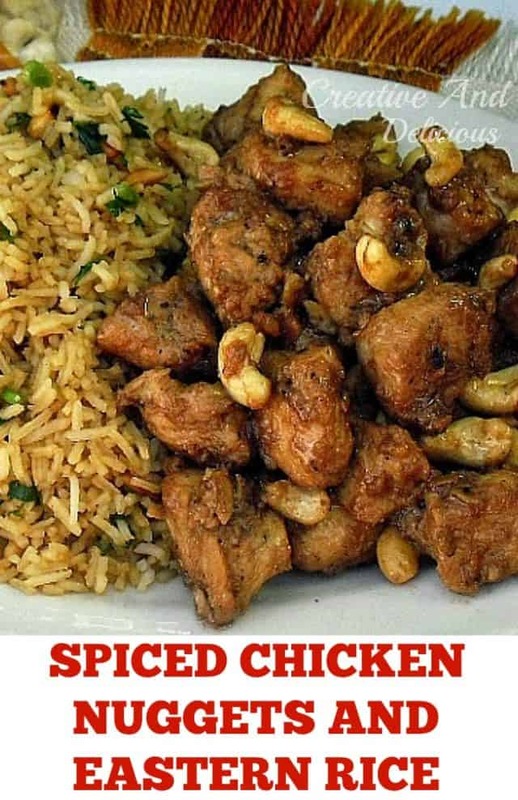 Your post has been pinned to my Recipes from Tasty Tuesday board. I can't wait to see what you link up next week! my husband would love this. Thanks for linking up at Tell Me About It Tuesday. We hope you hop over and share with us again next week. What an excellent plate! Both recipes look fantastic on their own. Putting them together takes it to another level. Great spices here, Linda. Thank you for sharing. This looks delicious! I'm always looking for a new ways to use my Chinese Five Spice. I can't wait to try this! Another great recipe you have.. You can also use five spice powder for making meat rolls, braised ducks and etc… You food looks delish. Thank for joining 4 seasons blog hop. Cheers and have a nice day. What a delicious plate Linda. Thank you so much for sharing the recipe at Tasty Tuesday. I am featuring it this week. Hope you'll drop by this week and share some more fabulous recipes with us.